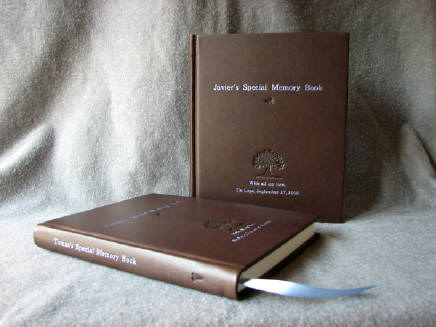 Created to last a lifetime, this set of books was commissioned by my customer for her new nephews Tomas and Javier. These books will be written in throughout the twins' lives at every event from baptisms to birthdays to graduations to weddings. The look is classic with just a touch of pale blue to suggest twin boys. 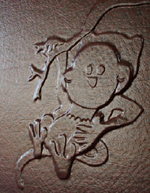 The blind embossed decorations include acorns, meant to represent the children, and a tree meant to represent the family tree that they are now a part of. The appeal of this album lies largely in the extremely adorable black and white cover photo provided by my customer. The rest of the album has been kept simple so as not to compete with the photograph. 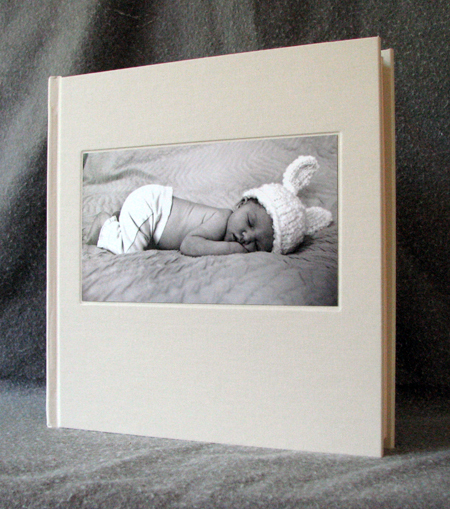 The palest of pale pink endpapers were added as the only suggestion that this is a baby girl. A favorite quote appears on the back cover with the baby's name on the spine. I love non-traditional baby albums. 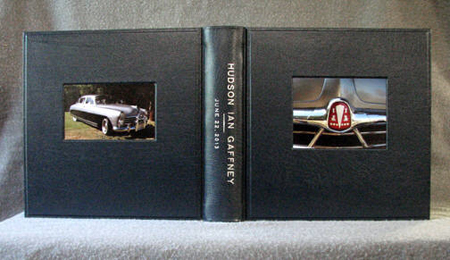 This one, for a baby named "Hudson", features some great photos of an antique Hudson automobile. This is a clean, classic, interesting baby album; nothing cutesy about it. I loved this one. The pages are heavy, acid-free paper with the natural deckled edge left on the outer edge of each page to enhance the handcrafted look. The silver lettering on the spine compliments the silver chrome and automotive paint in the cover photos. 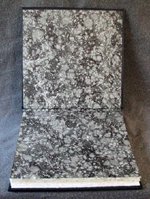 The gray stone pattern endpapers further compliment the color scheme. 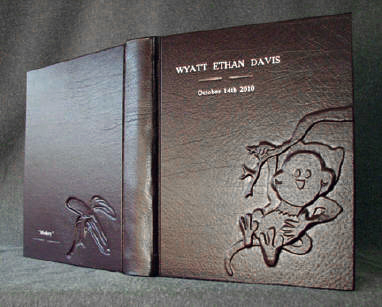 Created for a baby whose family nicknamed "monkey", the playful raised design on the front cover was based on Wyatt's mom's monkey tattoo that she got in honor of him. There is a recessed banana carved into the back cover. 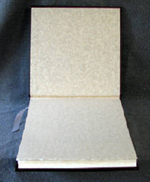 Simple silver lettering was added to the front and back covers and a custom clamshell box was made to protect the book. 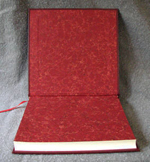 The clamshell box, covered in burgundy and charcoal linen book cloths compliments the burgundy leather of the book. Not exactly a baby book, this blank book was created for my customer's son's teachers to write in as he went through school. The idea was to have a place where, every year, a teacher could record their comments and memories of my customer's son. My customer requested a fire truck theme, so of course it had to be red! 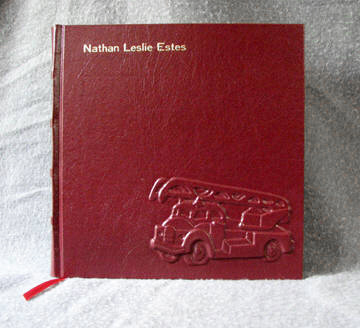 There is a raised old-fashioned hook and ladder firetruck on the front cover and a carved, recessed fireman's hat on the back cover. Raised cords on the spine outlined in gold give the book a classic feel as does the ribbon page marker and the marbled endpapers. Made to last, this book should follow my customer's son through grade school and beyond. A book does not have to be bound in leather to be effective. 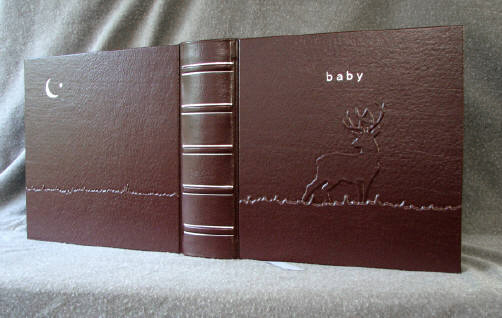 This unique baby journal and album set is bound in dark green vellum book cloth. 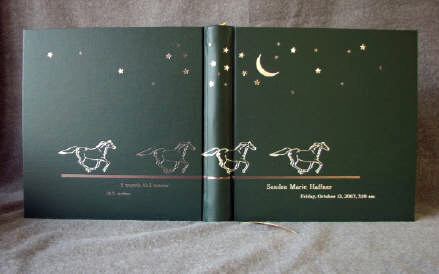 The cover features a herd of running horses in silver and pewter foil, running under a starry night sky. The stars were stamped in several foil colors including silver, chrome, and pewter. The horses run along a ground line and under that line, all of the baby's information is stamped in either silver or pewter foil. The parents of this child wanted horses on the cover because the baby did a lot of kicking in utero. 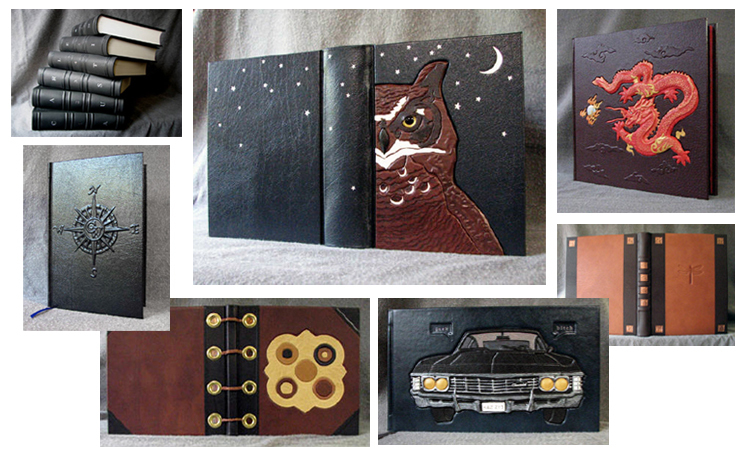 An album was made to match the journal (album pictured on the right). 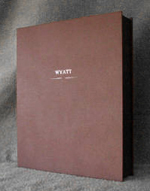 - lettering on cover added using moveable metal type, hot foil stamping, and silver and pewter stamping foil. Another not-your-typical baby album. My customer requested a nature theme and wanted a buck with a full rack on the front. We decided on a night scene where the silhouette of the animal made sense. This album has a raised ground line and raised buck with a cresent moon and star on the back cover. There is no lettering on the spine; only wide raised cords accented with silver lines. This album manages to look monumental and classic. Every project is a collaboration. Please contact me to get our collaboration started!